William Quincy Belle: Obamacare: Congratulations on doing the right thing, America! I work hard. I make my own living. I can pay for my own health insurance. If you can't, it's your fault. You should go get a job. This isn't a charity. You have a pre-existing medical condition? You've already had a lump removed? This is your second tumor? The insurance company has the right to make a profit. It if can't make a profit, it has the right to refuse you coverage or it has the right to charge you a higher premium. This isn't a charity. Can't afford health insurance? Then go without. The country can't go bankrupt supporting people who can't support themselves. This isn't a charity. As I stand off to one side and listen to the debate rage on over the question of health care, I am surprised at the amount of misinformation being passed around as fact in order to justify a point of view. Yes, I work hard and I deserve to keep my slice of the pie but who's looking at the bigger picture? I am but one person looking out for myself and my family. Who's looking out for the entire country, for the collective us? What? 18,000 people die each year because they have no health insurance? Holy Hannah. What? 50 million people do not have health insurance? How the heck do they take care of themselves? What? When I joke along with Stephen Colbert yelling, "We're number one! We're number one!" referring to the United States as being the number one country in the world, I didn't mean number one in spending on health care. The Emergency Medical Treatment and Active Labor Act (EMTALA) of 1986 requires hospitals to provide care to anyone needing emergency healthcare treatment regardless of citizenship, legal status or ability to pay. There are no reimbursement provisions. (Wikipedia) This means anybody can seek treatment even those who are uninsured. This is also called uncompensated care or charity care. What it means is that instead of going to a family doctor, somebody without health insurance can go to emergency. They do go to emergency because they have the right to and they can't afford to go elsewhere. Instead of somebody visiting a family doctor they go to hospital emergency. Which costs more the family doctor or emergency? The American Hospital Association estimated that the uncompensated hospital care costs for the year 2007 to be $34 billion. In a March 9, 2010 article from The Urban Institute, the authors John Holahan and Bowen Garrett estimated the future costs of uncompensated care for the period 2014 - 2019 to be $330 billion if the system is reformed. If the system is not reformed, the cost of uncompensated care would be between $560 and $700 billion. Insuring people is going to cost. But not insuring people does not mean there is no cost to the health system or to the country. Anybody has the right to go to emergency and if they don't have health insurance that is the only place they can go and going to emergency is not free. Okay, it may be free for the individual but there is a cost to the system, the uncompensated charity care. Thank God I have a job. Thank God I can afford health insurance. Thank God I'm lucky enough to be part of the top twenty percent, never mind the 1%. I have a job. Thank God. Thank God I pay taxes. Paying taxes means I have a job. Paying taxes means I make enough money to be even eligible to pay taxes. Paying taxes means I have money in my pocket. But what about the people who don't have a job? What about the people who have a job but who earn so little, they still need help? What about the people who have to pay for food first then don't have enough for health insurance? Is health a privilege or is health a right? On his first day in office, Mitt Romney will issue an executive order that paves the way for the federal government to issue Obamacare waivers to all fifty states. He will then work with Congress to repeal the full legislation as quickly as possible. A vote for Mitt Romney is a vote to let 18,000 people die. According to the World Health Organization (WHO), the United States spent more on health care per capita ($7,146), and more on health care as percentage of its GDP (15.2%), than any other nation in 2008. The United States had the fourth highest level of government health care spending per capita ($3,426), behind three countries with higher levels of GDP per capita: Monaco, Luxembourg, and Norway. A report from the Institute of Medicine of the National Academies states: "Lack of health insurance causes roughly 18,000 unnecessary deaths every year in the United States." A 2009 Harvard study published in the American Journal of Public Health found more than 44,800 excess deaths annually in the United States associated with uninsurance. Johns Hopkins University professor Vicente Navarro stated, more broadly, in 2003, "the problem does not end here, with the uninsured. An even larger problem is the underinsured" and "The most credible estimate of the number of people in the United States who have died because of lack of medical care was provided by a study carried out by Harvard Medical School Professors David Himmelstein and Steffie Woolhandler (New England Journal of Medicine 336, no. 11 ). They concluded that almost 100,000 people died in the United States each year because of lack of needed care—three times the number of people who died of AIDS." In the United States, charity care (also known as uncompensated care) is health care provided for free or at reduced prices to low income patients. One estimate put the cost of uncompensated care for 2004 at $41 billion, of which $34.6 billion was funded through a patchwork of government programs. A sobering statistic emerged on Thursday as the United States Supreme Court prepared to deliver its judgment on Obamacare. It confirmed that the U.S. spends more per capita on publicly funded health care than almost every other country in the developed world. And that includes countries that provide free health care to all their citizens. Health spending accounted for 17.6% of GDP in the United States in 2010... by far the highest share in the OECD, and a full eight percentage points higher than the OECD average of 9.5%. The United States spent 8233 USD on health per capita in 2010, two-and-a-half times more than the OECD average of 3268 USD (adjusted for purchasing power parity). Despite the relatively high level of health expenditure in the United States, there are fewer physicians per capita than in most other OECD countries. The number of curative care hospital beds in the United States was 2.6 per 1000 population in 2009 (latest year available), lower than the OECD average of 3.4 beds. In the United States, life expectancy at birth increased by almost 9 years between 1960 and 2010, but this is less than the increase of 11 years on average in OECD countries. In the United States, the obesity rate among adults was 35.9% in 2010, up from 15% in 1978. This is the highest rate among OECD countries. The average for the 15 OECD countries with measured data was 22.2% in 2010. We estimate that from 2014 to 2019, uncompensated care costs would be $330 billion with the Senate bill and about $240 billion under the House bill. In contrast, the cost of uncompensated care over the same period without reform would be between $560 and $700 billion. 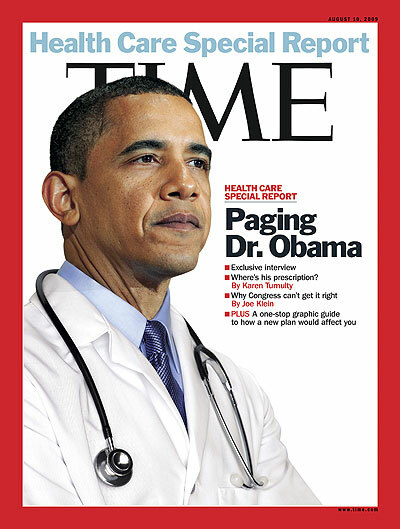 The big transition, the creeping socialism that Obamacare detractors are really worried about, will arrive in 2014. That's when everyone will either have to get insurance or pay a tax. The funny thing is, creeping socialism probably won't feel much different than the current system. Imagine, if you will, an ordinary, middle class family. For mom and dad, who work full time, insurance will still be provided through work. They'll still go to the same doctor, pay the same copay, and head to the same hospital when things get dire. Their kids will still get the same care, too, although they'll be able to take advantage of their parents' health insurance until they're 26, if they need to. One in six Americans does not have health insurance, and many live sicker and die younger because of it. Wow. Excellent piece. And yes, the thought of Romney winning the Presidency makes me want to crawl under the covers and hide.